My reviews of the first nine books in the series: Maisie Dobbs, Birds of a Feather, Pardonable Lies, Messenger of Truth, An Incomplete Revenge, Among the Mad, The Mapping of Love and Death, A Lesson in Secrets, and An Elegy for Eddie. For the first time in ten books, Maisie Dobbs is not truly ready for her next case. Of course, she has never failed a case so utterly as she did her last big one. Maisie doesn’t really do failure well, and this one is eating at her. It doesn’t help that the man she considers responsible, the one she could not bring to justice, is one who is constantly at the periphery of her every day life, and would be even closer if she weren’t actively working to keep him away. His presence is a constant reminder to Maisie of the time she failed, all the ways she is not everything she wants to be, and so nothing is really right: not her work, not her relationship with James. What Maisie really wants, what she feels that she needs, is experience. Marcel traveled widely and Maisie feels that it was those travels that helped him become as perceptive and empathetic as he was in the years that she knew him, and so Maisie desires to leave the life she knows and the man who loves her and travel. Leaving Everything Most Loved does involve a case, but it almost seems beside the point. Maisie is pulled in on the case of an Indian woman killed two months earlier. The case went cold for Scotland Yard and they effectively dropped it, until her brother arrived to agitate for justice. Frustrated with the police, Mr. Pramal is referred to Maisie by her own mentor’s mentor. Maisie investigates, but she is more inside her own head than is typical. She seems almost to be going through the motions, more focused on where her own life is going than on Usha Pramal’s murder. 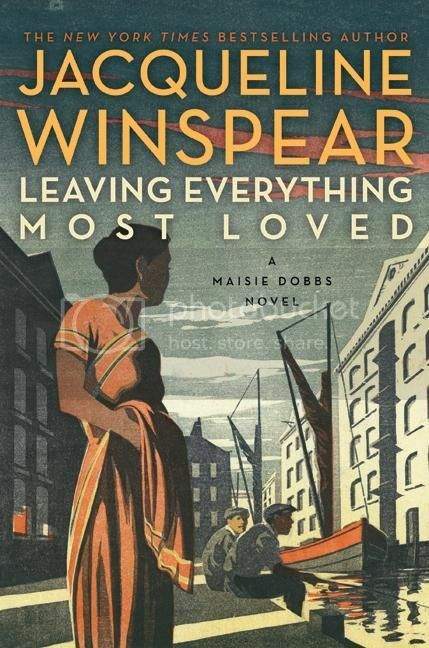 If you haven’t read any of the Maisie Dobbs series before and are thinking about starting here, please picture me waving big red flags. Don’t do it! Leaving Everything Most Loved is so much more internal and with so much less plot than most of Winspear’s series. Also, because this is the 10th book in the series, much of the background for this time of contemplation comes not from the 260 or so pages of Leaving Everything Most Loved, but from the couple of thousand pages preceding it. If you haven’t read the previous books, you are simply not going to care, and if you haven’t read Elegy for Eddie, you are not really going to grasp Maisie’s sorrow. Even fans of the series may need to be in the right mood to enjoy Leaving Everything Most Loved, as it has a very different feel from the rest of the series. However, it seems that it is going to be important as a transitional book (at least, I assume it is a transition, and not an ending). Not your typical Maisie Dobbs experience, but many fans will appreciate the intense look into Maisie’s psyche. I wouldn’t be surprised if part of your trouble with Elegy for Eddie came from the fact that it was book 9 and a lot of the reason you would care what happens there is wrapped up in the 8 previous books. I really think you should read the rest in order. I’ve been wondering about this one. I could feel the direction moving, which I appreciate, but at the same time, Maisie in her head is what drives me insane. It’s a little too much sometimes. I will, of course, read this, but I’ll reserve my excitement for the book after this one. I heard that about this book, and I assumed it would be like that after the previous one. I thought Elegy for Eddie was the start of that transitional period. Seeing my thoughts, would you recommend I stick to it and try volume 1?? Good to alert folks not to start with this one. It’s quite different from previous books in the series and left me anxiously waiting to find out what’s next for Maisie. I feel like I need to stand in front of every bookstore display with giant flags yelling “DO NOT START HERE!! !” because little good can come of it.